Amber Rose in Barbados steering a sail boat on her way snorkeling, seems like fun, enjoy your life girl. Fergie making her way thru traffic in New York City, gotta say her legs look great. 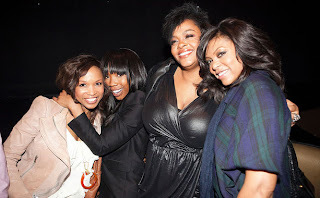 Jill Scott , Taraji P Henson, Elise Neal and Brandy at the Grey goose Presents Jill Scott Event in Hollywood California.